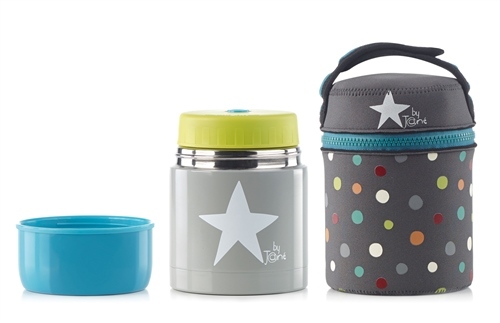 Stainless Steel Baby Thermal Food Flask 550cc & Carry bag. The Jane Stainless Steel Thermal Food Flask can keep food hot or cold for up to 10 hours due to the insulation of the airtight seal of its double vacuum wall. Light, practical and safe, ideal for using at home and when you're out and about. It has a double closing system. The first smaller lid is sealed with silicone to prevent liquid from leaking out. The outer lid is bigger and can be used as a bowl making it easier to feed the child and leaving the rest of the food inside the flask so it stays hot. It has a nylon carrying bag making it very convenient on journeys. with a 550 CC capacity. Can keep food hot or cold for up to 10 hours. Its wide lid ensures an airtight seal thanks to the non-porous materials that do not absorb or permit changes to the taste of the food. The lid has a button in the middle. Press this button to release the condensed air from inside before opening the lid. This makes it easier to open. The outer lid is bigger and can be used as a bowl for feeding baby. It has a double closing system. Ideal for using at home and when you're out and about. Includes a carry bag with handle. Available in assorted designs and colours. 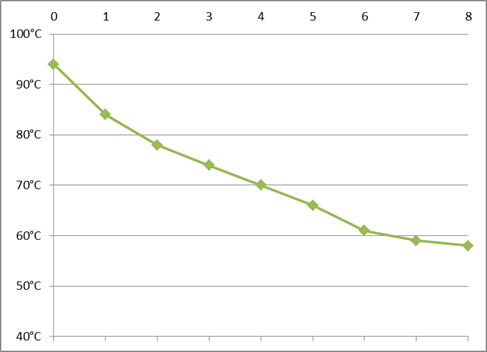 The following chart is an indication of the temperature of the flasks contents over a typical 8 hour period and should only be used as a guideline. The temperature is dependent on the contents of the flask. This is a great product!! Really love it. My daughter uses it to take soup to school. We put pasta, leftover dinner in it. It’s perfect for hot and cold food. She loves it. It’s a big hit at school.